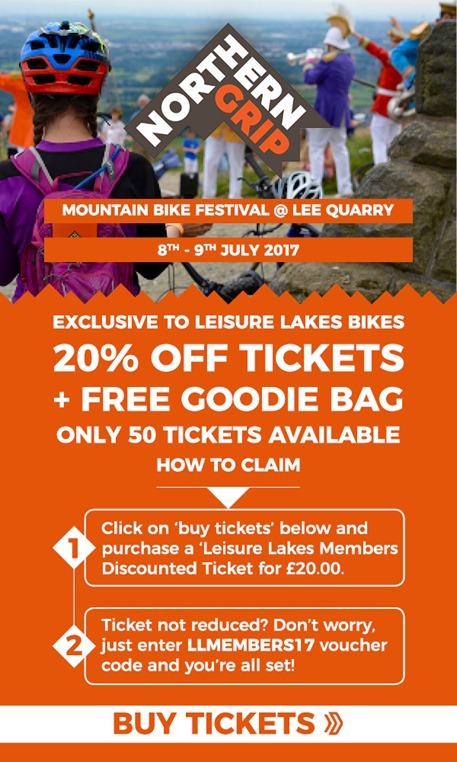 The Northern Grip mountain bike festival is back for it’s second year in 2017 and will be hitting Lee Quarry on the 8th-9th July for another weekend celebrating what riding ‘up North’ is all about. We are excited to be partners with Northern Grip and are offering 20% off tickets + a FREE goodie bag exclusively to our customers! There are only x50 of these tickets available so if you want one you’ll have to be quick! Buy your tickets now! We will be joining the Northern Grip festival for 2017 with a large range of demo bikes from Orange, Specialized, Haibike and hopefully Yeti (TBC) along with a demo fleet of Five Ten shoes! We will also have a load of festival offers on so you can grab a bargain before a beer! Northern Grip was started by a group of friends who wanted to make an event that gets together like minded people to ride, eat, drink and be merry around the unique trails in the area. The North really does have some great riding available and by creating a festival combining some great riding along side music, good food and beer, it’s a recipe for a great time! The idea of Northern Grip festival was essentially to celebrate mountain biking and all that comes with it. The outdoors, the dirt, the bikes, the thrills, the spills and – more importantly – the people and the post-ride pie, pint and party. The concept of Northern Grip was for people to be out during the day having fun with bikes and then to head back to the event hub for some dancing. Northern Grip kicks off so head to the welcome tent to exchange your tickets for a wristband and head into the Northern Grip Hub to see what’s going on there! Check back at the Hub to see catch up with the local brands, food, drink and take in the entertainment. Once the festival wraps up everyone on the hill we'll be heading back to the valley for more music, drinking and dancing! Northern Grip takes a new form on the Sunday and is one big ‘morning after ride’ (this is how we do it in the North!) so for those that make it out of bed the next day, everyone meet for breakfast and heads out for one big ride to clear the heads and stretch the legs! Tickets - £25 & Kids go free! Tickets for the event are £25 each but with every paying adult you can bring x2 under 16s for FREE! Get your tickets here!